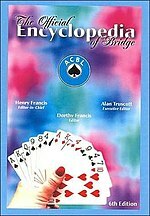 The Official Encyclopedia of Bridge (OEB) presents comprehensive information on the card game contract bridge with limited information on related games and on playing cards. It is "official" in reference to the American Contract Bridge League (ACBL) which authorized its production and whose staff prepared and/or supervised its various editions. The first edition of the Encyclopedia was published in 1964 with Richard Frey as Editor-in-Chief; it was the only one with an edition revised for an overseas market (The Bridge Players' Encyclopedia, 1967). The seventh and latest edition was published in 2011 following intermediate editions in 1971, 1976, 1984, 1994 and 2001. The Executive Editor for the first six was Alan Truscott, bridge editor of The New York Times. For the fourth through sixth editions, Henry Francis succeeded Frey as Editor-in-Chief. Frey and Francis were also successive editors of the ACBL monthly membership magazine. Numerous contributing editors to the Encyclopedia were listed in each edition as were members of Editorial Advisory Boards. The redesigned seventh edition, in preparation since 2006, was released in November 2011. Editor was Brent Manley, with primary assistance from Mark Horton, Barry Rigal and Tracey Yarbro. This is the first edition to depart from the traditional alphabetical listing of individual entries and present a compilation of entries grouped into chapters, such as Bidding, Conventions and Card Play. Numerous photographs are included, together with 2 CDs; one containing the full printed version of the Encyclopedia and the other with biographies and tournament results. The only previous Encyclopedia of Bridge was edited by Ely Culbertson and published in 1935 ... 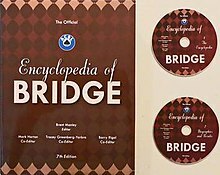 The ambitious goal set for this Official Encyclopedia of Bridge was simple to state: "To provide an official and authoritative answer to any question a reader might ask about the game of contract bridge and its leading players." This encyclopedia is the most complete and authoritative book of information, guidance, and instruction for bridge players, ever published. It covers every aspect of bridge in all bridge-playing countries of the world; it contains complete and lucid definitions of every term; it describes and illustrates every standard bid, every recognized convention, and every type of play. Main listings: The Introduction  indicates that the entries in the main listings fall into five main categories (technical, historical, procedural, biographical and geographical, and terminological) and are presented alphabetically over 683 pages with entries frequently ending with cross-references to other entries on related category topics. Over 50 bridge-playing countries are listed and brief biographies of over 1,500 American and over 400 other players are recorded. Bibliography: The main listings are followed by an eight-page bibliography. The Harvard University online catalog entry for the first edition includes a note that "A great majority of the unsigned technical entries are by Alan Truscott." In 1967 an edition revised for the needs of a British and European audience was published by Paul Hamlyn (London) under the title The Bridge Players' Encyclopedia. It was described as an International Edition based on The Official Encyclopedia of Bridge of 1964. The edition modified American spellings, 'translated' bidding structures to the more widely used Acol system, omitted biographical notes on some lesser known Americans and added biographical notes on British and European players resulting in coverage of over 50 countries and over 500 players. The editors were Ben Cohen and Rhoda Barrow. Main listings: technical bidding and play, historical, procedural (tournament organization, laws, etc. ), geographical, and terminological. As in the first edition, entries frequently end with cross-references to other entries on related topics. Biographies of leading personalities: The biographies include over 2,000 Americans and over 500 players from elsewhere. Bibliography: listed according to subject matter. ... the newly uncovered evidence that bridge was known and played before the earliest previous accreditation (to Russia) of its origin and its name. The third edition is organized into the same four parts as the second. There are again over 2,500 biographies but newer and stricter criteria were applied and many previous entries have been superseded by new ones; successes in competitions remain in the appropriate event listings. ... a quantum leap in the technical material ... many new and intriguing methods and ideas have made their appearance in the past seven years, and some have been widely adopted. The organization of the fourth edition follows that of the third and second. The changes in the technical section have been far greater than in any of the earlier editions, reflecting the many theoretical advances in the past decade. The four part organization of the book follows the format of its immediate predecessors. More than 2,800 bridge personalities are listed in the biographies, largely updated by Dorthy Fancis; Truscott prepared most of the technical and foreign material with Frank Stewart contributing significantly to the technical; the expanded 21 page bibliography was prepared by William Sachen. Previous editions were published by Crown Publishers Inc. of New York; the 5th edition was published by the American Contract Bridge League. "This work is the most complete and authoritative book of information, guidance and instruction ever published for bridge players." This edition has been prepared primarily by Henry Francis, with major contributions and help from Alan Truscott and Barry Rigal. Once again Dorthy Francis has updated American biographies and world-wide tournament results. Tim Bourke, who owns one of the world's most complete bridge libraries and who assembled the Morehead Library at ACBL Headquarters, prepared the bibliography. The four part organization of the book follows the format of its immediate predecessors. More than 3,000 bridge personalities are listed in the biographies; the 60 page bibliography doubled that of the previous edition. The 7th edition had its beginning about 2006, when decisions were made about the format, the contents and the people who would be involved in putting it together. It departs from previous editions in several ways. Foremost is the medium: two CD-ROM volumes with one book whose contents match the first CD. All previous editions were one-volume books. This edition introduces photographs—lots of them. It comes with an index instead of a cross-reference table. In the print volume, both pages and font are bigger. The four-part organization introduced in 1971, with a very large alphabetical part one, has been replaced by about 40 chapters and appendices. The printed book and the first CD both comprise chapters 1 to 26. The second volume, CD only, comprises eight chapters of biographical entries and three appendices on Masterpoints achievements and tournament results. The book contains the following Table of Contents; the first of two compact discs (CD) contains a Portable Document Format (pdf) version of the book. The second CD provides more information about bridge people and competitions per the following table of contents; its contents are not available in print. ^ Foreword to the 1st edition. ^ a b Introduction to the 1st edition. ^ Foreword to the International Edition, 1967. ^ Foreword to the 2nd edition. ^ Introduction to the 2nd edition. ^ Foreword to the 4th edition. ^ a b Introduction to the 7th edition.